Home/Restaurant Industry/Trends/Should Restaurants Go Cash-Free? Cashless restaurants do not accept cash payments and instead require customers to use credit cards, debit cards, cash cards, or contactless payment systems. So, should your restaurant go cash-free? We’ve done some research and rounded up the most common arguments for and against going cashless. Danny Meyer, who has led the charge against going tip-free, has already gone cash-free at four of the restaurants in his Union Square Hospitality group, mega chains Sweetgreen, Dos Toros, and Tender Greens have banned cash at all of their locations, and Dig Inn has gone cashless at most of its locations. 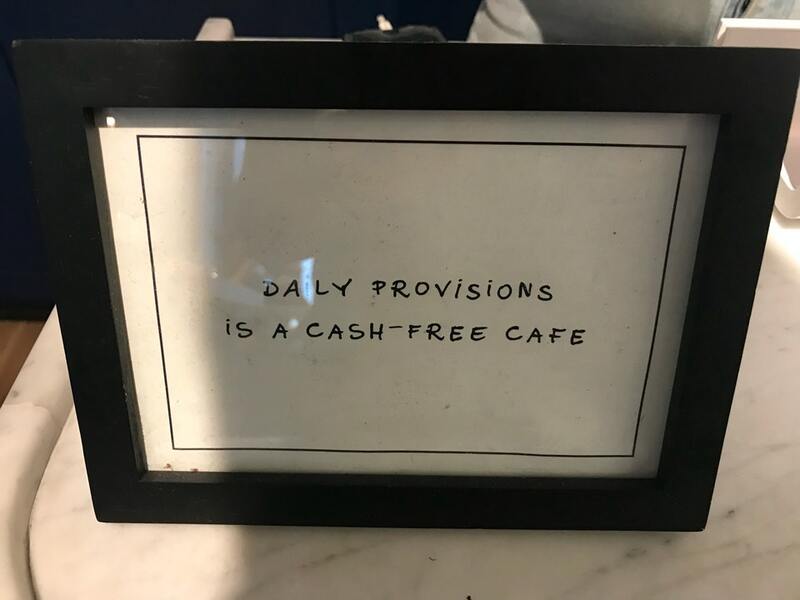 Sign at the register of Meyer’s Daily Provisions via FourSquare user Chris M.
There are some clear reasons that more and more restaurants have been ditching cash. First, it’s safer for restaurants to not have large sums of cash on site. If you don’t have cash, you’re far less likely to be robbed. Park Cafe in Baltimore was robbed five times in just four months before it went cashless in 2017. Not only is it safer to not keep cash on-site, it’s also cheaper. When restaurants accept cash, they transfer it to banks in armored vehicles. Doing away with cash lets restaurants cut that cost. Going cash-free makes things easier for restaurant employees as well. At most restaurants, employees spend time counting cash and also change out cash trays in between shifts. Without having to manage cash, employees will be able to devote more time to their other job duties. Many restaurants believe that going cash-free is better for customers too. Salad chain Tender Greens, says that going cash-free has been popular with their customers who are often in a hurry. At cash-free restaurants, customers merely need to slap down a card instead of searching for the right amount of cash and waiting for change. If everybody at a fast-casual restaurant pays with a card, the line will move much faster. The report also noted that cash can carry E. coli, salmonella and Staphylococcus aureus, all of which can cause serious illness. It’s pretty unnerving that the same people who handle and deliver customers’ food are also regularly handling cash, isn’t it? [In some of our restaurants, we’ve chosen to eliminate cash, accepting only debit/credit cards and payment through the Dig Inn app. We made this change in restaurants where 8% or less of transactions were cash. We exhaustively debated the decision, considering it from all angles before finally opting to go cash-free. At Dig Inn, we carefully examine how every business action aligns with our values of sourcing ingredients from as close to home as possible, investing in our chefs, and serving delicious, vegetable-forward food. Most of our chefs’ time is spent prepping and cooking fresh produce, coaching kitchen teams, creating innovative lunch and dinner specials, and getting to know guests. All of this contributes to their growth and development as culinary leaders. But a sizable chunk of each day was dedicated to cash management – two hours to be specific. While we’ve got amazing cashiers tending the registers, our chefs are also restaurant managers and responsible for counting the cash, writing deposit slips, making bank runs, and buying change. Since we’ve removed the burden of cash from our teams, they can now devote their time and energy to serving guests and cooking great food. Investing in our chefs also means investing in their safety. Moving to card-and-app-only payments means our teams aren’t holding onto large amounts of cash at any time, making them less of a target for theft in the restaurants or on the way to the bank. Going cash-free sounds like a no-brainer, right? Not exactly. Although there are some pretty compelling arguments for going cash-free, there are also some hidden costs. By not accepting cash, restaurants are inadvertently discriminating against people who don’t have debit or credit cards (including ⅓ of Americans ages 18-37). According to Linnea Lassiter, a former analyst at the D.C. Fiscal Policy Institute, employment status, income, race, and immigration status are among the biggest factors influencing whether or not somebody has a bank account. For example, many low-income individuals don’t have bank accounts so that they can avoid fees if they fail to meet a minimum balance requirement. Cash-free restaurants also discriminate against teenage diners who are old enough to visit restaurants without their parents but too young to have their own bank accounts. Two years ago, Massachusetts signed a bill barring cashless restaurants into law. Now, other cities and states are mulling over legislation of their own. On June 26th, D.C. city council member David Grosso introduced a bill that would prevent local restaurants from going cashless. The bill would make it illegal to discriminate against cash as a form of payment, post signs that cash is not accepted, and charge different prices for customers who pay with cash as opposed to a card. Many restaurant owners also stand against the cash-free movement. So, should your customers put their cash away? As you can see, there a number of factors that you need to consider before deciding if going cash-free is right for your restaurant.